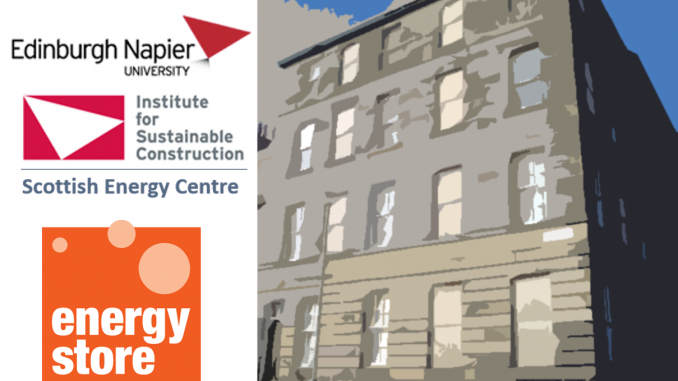 Researchers at the Scottish Energy Centre start project with Energystore Ltd to test the thermal performance of tenement sandstone walls. The Construction Scotland Innovation Centre (CSIC) funded project led by Julio Bros-Williamson of the Scottish Energy Centre (SEC), is a research project in collaboration with Energystore Ltd and Everwarm Group Ltd. 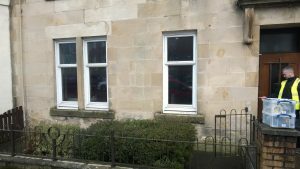 The aim of the project is to evaluate the thermal performance of solid stone (sandstone) wall tenements in Glasgow and Edinburgh before and after thermal improvements have been applied. EnergsStore are a leading bead insulation manufacturer who are interested in further developing the injection of insulation behind lath and plaster or plasterboard internal dry linings of many of the existing tenements in Scotland in order to improve their thermal efficiency. This project follows-on from a stage 2 successful Interface voucher project assessing acoustic performance of the bead system. Researchers at the SEC have preeminent experience in modelling and monitoring the in-situ thermal transmission (U-value) of walls, particularly historic buildings; after work conducted on behalf of Historic Environment Scotland. This work, undertaken between 2010 and 2016 measured the thermal performance of 18 buildings and over 70 different wall, floor and roof combinations. This new project with Energystore Ltd builds upon the methodology used in order to obtain a baseline performance. After insulation has been injected the buildings are re-tested to establish the thermal benefits and performance improvements. Additionally, the dwellings will be tested to measure the air permeability at the pre- and post-stages of the thermal upgrades to measure possible improvements in the reduction of air infiltration. Currently equipment is being deployed at the pre-intervention stages, which involves a dwelling and wall survey inspection. 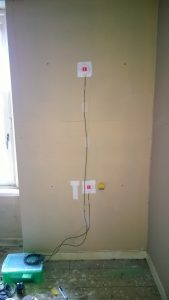 Following this, heat flux apparatus with data loggers, and temperature logging equipment is attached to the inside of the walls and analysed to obtain an existing as-built thermal transmission value, see Figure 01 and 02. This research study will enhance the understanding of the performance and application of poly-bead product and might also be a critical factor in the deployment of retrofit methods under Everwarm Group Ltd portfolio. The project also aims to contribute to the reduction of the environmental impact of such dwellings in Scotland by reducing the demand in energy for heating and improve the thermal comfort for their residents.